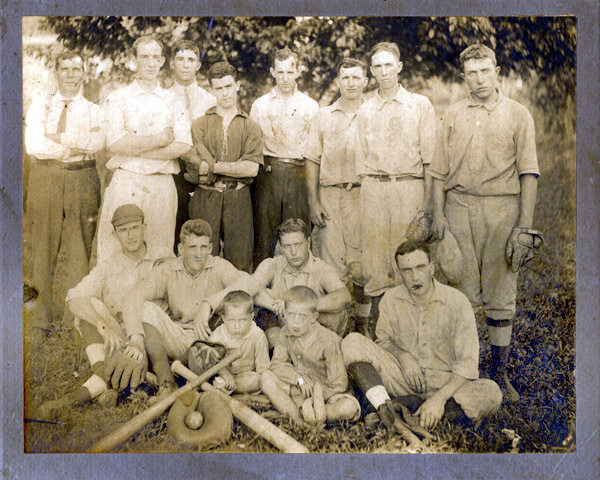 First Row (Seated, L to R): (13) Walter Geyer, Mascot; (14) Andrew J. Geyer, Jr., Mascot. This local club played their games at the old wooden grandstand, pictured below and constructed in 1910 in the big lot now known as Dorrier Park. Over the grandstand's front was stretched chicken coop wire, and just in front of it stood the ball diamond that was used by school and community teams until the 1950's. It was Thursday, June 11, 1953, when the Scottsville Sun newspaper announced the local baseball team's winning streak. They beat Alberene 5-2 at home, giving them a 6 and 0 record for the season. "Austin Easton was heavy hitter...3 hits out of 4 at-bats, one of which was a double," and Talmadge Tyler and Joe Brochu both got triples. The Scottsville team, the Sun reported "will enter the State Tournament in Charlottesville." Billy Goodwin was manager, Austin Easton, the team captain. Other names -- last only-- on the roster: Rittenhouse, Childress, Hamner, Moulton, Maupin, and Price. June 28, 1953, Scottsville engaged in "a hurling duel" with a team from Buckingham. Pitcher Simpson "bested Lefty Watts...as the local nine edged Buckingham, 2 to 1. Simpson gave up three hits, one a homer. Easton scored the winning run for Scottsville on a triple, coming home on an out." June 25, 1954, the sad news was reported in the Sun's center column of the front page: "Scottsville Nine Loses First Game of the Season, 6 to 5." Playing in Shipman, Joe Brochu's home run wasn't enough to lift Scottsville team to victory. In early May 1953, the Scottsville team's schedule was announced for the Tri-County League. From May 10 through September 13 they would play teams from Alberene, Charlottesville Motors, Superior Stone, Buckingham, Shipman and elsewhere. "The biggest thing that happened in Scottsville was the Sunday baseball game." Bill Mason remembers. "I was really into baseball," he says, and though he didn't play past high school, Bill was a bat boy for Scottsville when he was around 10 to 12 years old. Billy Pitts, who "was born downtown," would go every Sunday at 2 pm to watch the Scottsville team play. There was no gate, but a man with a cigar box would take your quarter, and maybe a hat would be passed during the game for fund raising." 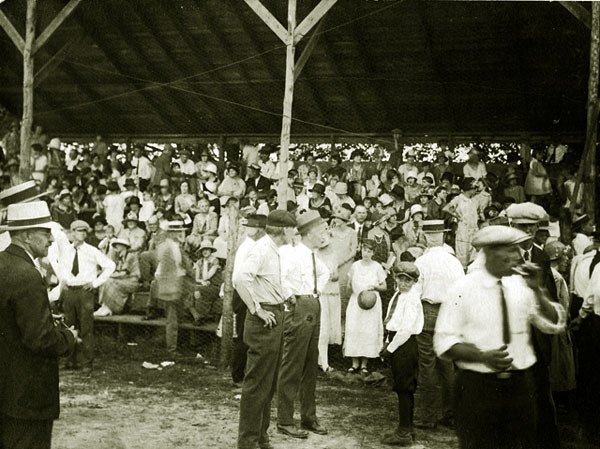 The grandstand, six to eight feet high as Bill recalls, was essentially just south of where the Scottsville Farmers Market is located now with center field toward the rear wall of the former post office, left field where the basketball hoop is currently located. Behind the seats was a creek -- it's there still; foul balls would pop into the poison ivy and mud, and kids were paid to fetch the balls from the creek as "there weren't but so many baseballs," according to Tommy Stargell. Stargell recalls the grandstand as a "nice sound structure"; others remember it as a bit more rickety. The grandstand sat two to three hundred spectators, thinks Bobby Pollard. The stands were built by Red Rittenhouse, who ran a construction company as well as managed the baseball team. Red also mowed the grass each Saturday. Junior Tyler, one of Scottsville's star players, says they would fill the grandstand for each Sunday game; fans also went to away games in Greene, Lovingston, and Orange. "Greene and us had a hard time getting along," he recalls; "not the players, the fans!" Some people would pull up in their cars to sit and watch. No one remembers the grandstand in place after the flood of 1969. Bill Mason recalls concessions being sold by Leslie Harrison who had a stand and offered hot dogs, hamburgers and soft drinks cooled in wooden half barrels of ice. Harrison was "a real fixture at each game." Food could have been bought at Lumpkins restaurant or Dawson's stand as well. Other men remembered that sometimes pies or cakes would be donated for sale. Marvin Ripley recalls that a fund raiser might involve something like a special seed being baked into a cake that would win the person who bought it a prize. While the Tri-County League shifted names and makeup over the years before "fading away in the 1960's, according to Ripley, in the 1960's, it benefitted from the strong baseball program at Scottsville High School. Until 1967 the school fielded excellent teams ever since the middle of the 1920's, according to John Randolph Phillips in Of Town and the River, " Baseball was coached by John Pitts, a baseball genius...[The team was} remarkable for a small-town high school." Dave Cattlett, who played third base for Scottsville High School, says, "We beat everybody. It doesn't get any better than that!...I remember all of the players: 9 Fernybough boys from Carter's Bridge; pitchers Arthur Thacker, Whitfield Bryant, and Jackie Armstead; Billy Moon, and others." Thacker, a good friend of Cattlett, who moved to California, was "an ace pitcher with good control and a mixture of pitches." The other players on the team "didn't have to be but so good because of the pitching. We weren't necessarily the best in the world, but the best of the seven high schools in the area." Some of the high school players were on, or later joined the Scottsville town team. Red Clements was catcher in high school in 1947. "I have played ball all my life," he says. Red was on the high school and town team at the same time. He had to play center field for Scottsville, as players weren't allowed to hold the same position on both teams. Red recalls that the town team's practice was fairly informal: "in the afternoons, someone would be there to play"; "there was no special schedule. Local men would work as umpires. "Mr. Boatwrignt, SJ's daddy, was an excellent umpire. When he said 'strike' it was a strike!" At 6'4" at age 18 years, Red was the lead-off hitter. He recalls as one of his best memories a Fourth of July when a man from Richmond came in as their pitcher for a double-header and pitched the first game right-handed, the second game left-handed. "That's amazing!" Austin Easton recalled his Scottsville baseball days for the World War II oral history project at the Scottsville Museum. He played baseball for the Army and came home to Scottsville to play for the town. "I played 17 years for Scottsville as a catcher. When I came home from the war, I became a pitcher. Since I hit, I usually hit two home runs a game." Junior Tyler was a pitcher on the Scottsville team for years and is often mentioned by the others recalling Scottsville baseball. He began young, when his hometown of Schuyler didn't have a high school, and he stayed on the Scottsville team despite Schuyler having its own town team. Red Rittenhouse would often pick Junior up in Schuyler and drive him to the Scottsville games. Junior says he never had arm trouble, never had to learn to pitch. "I just played baseball all my life." Marvin Ripley, from Howardsville, played baseball for Scottsville High School as well as for the town. He recalls, "Every community, just about, had a team. They practiced some but they just played. This has disappeared now, except for kids. Back then, it was big time--uniforms and everything!" The team groomed the dirt infield laid out the bases and lines. Bill Mason tells about summer rain leaving puddles on the base paths; he recalls gasoline being poured on the water and set afire to evaporate the moisture. Ripley points out that the game was segregated; he says African-American teams played in some towns, and Scottsville would go to watch if the games were nearby. Scottsville used to play in Charlottesville he remembers, because they would give a trophy at a tournament drawing in 100 to 125 teams. "In high school," he said, "you know everybody--four or five on every team. We played as far away as Gladstone, Zion Crossroads, Buckingham. People always checked the rosters, talked about the players. Baseball was everything!" Among the men remembered on the Scottsville town team are Chester Baker, Gordon Rutland, Wilbur Bryant, and Charlie Roberts. Barbara Brochu recalled her father-in-law, Big Joe Brochu, a stand-out player who taught his grandchildren to throw and catch. "We'd all play on the weekends. He tried to pass on his expertise and was an inspiration to us all!" Remembered by everyone is Red Rittenhouse, the guiding force behind the Scottsville town team. "Red was the main guy--he kept it going," said Junior Tyler. Billy PItts puts it this way: "If it hadn't been for red, that town team wouldn't have lasted that long." Red paid for some of the baseball uniforms and cut the grass with his own tractor. "He was a real organizer!" said Bill Mason. Red's son, Keith, who as a child kept score for his father, says Red "was a really good baseball player." Keith chose four stories to tell about his father's character and impact on the game in Scottsville. He says Junior Tyler once hit a home run to center field, to where the post office would be built in 1965. Men standing out there declared that a time out had been called so the run didn't count. Junior sat down, dejected and frustrated. Red, the manager talked to him, "cajoled and reasoned with him", and got him to say he'd return to the game. Junior hit another home run! Once with Red catching in a close game, he was crouched over home plate, protecting it. The runner, one of two brothers on the opposing team, slid in with his spikes up and intentionally hit Red in the face. Red reacted, was going to go after the player, but Scottsville's Maynard Rice appeared, collared the runner as well as his brother and held them off the ground, one in each hand. "Red said, "I got so ticked at Maynard that I couldn't be mad anymore!" Red was the second oldest of ten siblings. During the Depression he left school to join the Civilian Conservation Corps, which had a baseball team in each camp. Playing one day, he "hit everything in sight," his son says. "Someone asked, 'Who are you--what's your job?' 'I'm Red Rittenhouse, and I don't have one.' 'Now you do--your're batting cleanup!'" Only later in life did Red confess to homesickness in the CCC camp. Red played into his 40s,, Keith says. Once Scottsville met an opposing team with semi-pro players and a fast ball pitcher. Bottom of the ninth, bases loaded, Red at bat. He fouled balls off, and the count got to 3 and 2. Keith's grandfather, watching his son, heard opposing fans taunting Red: "Ah, the old man can't hit." "Turns out, they were wrong," says Keith. The next foul went over Page Street beside the current playground. Then Red hit a line drive, and the ball landed beyond the road on the sidewalk in front of the school--a grand slam home run. Keith said, "After the dust settled, Grandfather looked over his shoulder and said, 'Oh, the old man can't hit, huh?' Very poignant." Keith recalls the names of more of the players: Jim Godsey; Eugene McKamey of Woodbridge; Homer Tyler; Ted Denby, a powerful left-hander; Ronny Lynch; Bill Mark; the Grummeck brothers from Antioch; and Cecil Shifflett. There's even earlier baseball in the Scottsville area. The women of the Algoma household, an estate near Howardsville and south of the James, kept a record of their summer activities in 1890-1893. Edited by Elizabeth Scott in 2003 and available to read in the Scottsville Library, the book tells of the social life of the well-to-do. July 6, 1892: the Howardsville boys played a baseball game with the Scottsville team, who won, 12-11." July 15, "The boys went down to Scottsville and played; they were beaten 15-13." The next year, June 23, 1893: "Grand game of baseball in Howardsville when the Howardsville team [finally] beat the Scottsville team." But on July 7, 1893, "The boys went to Scottsville to play baseball. Scottsville 10 Howardsville 8. The Scottsville 'umpire' cheated!" There were sometimes two teams in Scottsville, one fielded by the US Rubber Plant. in 1950-1953, the two teams would meet for donkey baseball, with predictable results. The point was hilarity and fund raising; often for the Lions, with the animals stealing the show. June 26, 1952, the Sun reported the 300 fans watched the Scottsville team beat the Rubber Plant 4-3, with "more falls than hits." "The big trouble...was the players' inability to remain on the back of their transportation." June 17, 1954, "side-splitting laughter" was recorded and $100 was raised for the Lions Club. The roster included Donald Carroll, Russell Moon, G.B. Cleveland, and Sam Spencer. Sometimes women played with Shirley Dorrier once getting on base, if not staying on the donkey. Considering the Scottsville town team and its opponents, Tommy Stargell says, "It was the closest thing you had then to professional ball. We loved it!" Some of the players mentioned here were considered professional quality, but no one really wanted to leave home, play in Arkansas or some other distant minor league. Red Clements said, "Funny thing--Charlottesville had Triple A; that was the extent of being promoted." There was no point and no need to look to baseball then as a profession. Tommy Stargell says, "I maintain that's when baseball was real--played by people like ourselves and played better than now." Why did town baseball end in Scottsville? Some of the men who considered this question said, like Junior Tyler, "The players got too old!" Marvin Ripley said that, after World War II and into the 1960's, "people got money and cars and other things to do. Roads were paved and everyone went looking for the party. Or girls. Or something faster than baseball; baseball was too slow." In Ken Burns' documentary "Baseball," poet Donald Hall says, "Baseball, because of its continuity over the space of America and the time of America, is a place where memory gathers." And Scottsville is definitely a part of that place!